Published: Aug. 5, 2016 at 03:09 p.m. Updated: Aug. 5, 2016 at 05:50 p.m. Guess what, guys? They're going to play actual, for real football this weekend. We made it, y'all. Sit back, enjoy a tasty beverage, watch the Hall of Fame Game and try to get a handle on whose fantasy stock could be on the move come Monday morning. In the meantime, we'll catch you up on what's happened since the last time we did this. 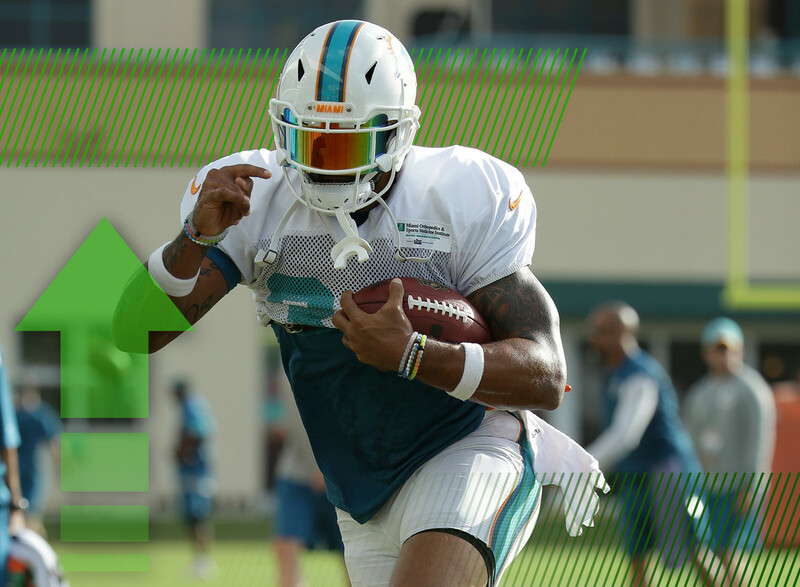 When the Dolphins added Foster a couple of weeks ago, it looked like he was going to play a secondary role in the offense behind Jay Ajayi. Since then, Ajayi has been sidelined with a bruised knee while Foster has reportedly been going HAM in practice. After spending the past month riding for Ajayi, I'm grudgingly conceding that Foster might end up being the starter in Miami. But considering the veteran's injury history over the past few years, I don't have to be excited about it. This is why we can't have nice things. Just when you start to get excited about Jeffery and his 2016 prospects, he leaves practice with a hamstring issue. It doesn't sound like it's anything too serious. But it is a reminder of why so many people are wary of spending an early round pick on him. If you decided to draft depth at the receiver position, it's worth using a second-round pick on Jeffery. But if you're risk averse, this is probably going to drive you further away. When the Twitter machine first started talking about Elliott having an injury, there was much weeping and gnashing of teeth. Turns out that the rookie running back is going to miss about a week of practice with a bum hamstring. It's not great, but it could be far worse. Even for a rookie as talented as Elliott, missing practice time is less than optimal. Consider this a temporary downgrade. Things will hopefully be back to normal soon. The worm has turned in the battle to be the Steelers No. 2 receiver. Entering the summer, it looked like Markus Wheaton was set to take the gig. Suddenly a big-bodied athletic receiver moves his way in to usurp Wheaton's spot. Previously it was Martavis Bryant. Now it looks like it's Coates' turn to do the deed. We're still waiting to see what role the winner of this competition will have. But there's little doubt that whoever becomes the starter will have the greater value. Currently, it's advantage Coates. Adam Rank is going to be upset with me when he reads this. Forte is dealing with a minor injury that could keep him out of the first preseason game. But that's not why he landed in this spot. What has me more concerned is talk that Forte and Bilal Powell could end up with a fairly even split in carries this season. Forte's ability as a pass-catcher could put him over the top, but after years of seeing him as a workhorse back, it will be an adjustment for fantasy fans to live with him as part of a committee. Can you hear that? The drum beats, they're getting louder. And they're pounding for Ferguson. If you're a football fan, it's hard not to love Frank Gore for what he's done in his career. But the end is coming soon and the Colts know it. There's almost no depth at the running back position in Indy, but there's talk that Ferguson could be their version of Dion Lewis. That alone is reason enough to get excited about the rookie as a late round option -- especially in PPR leagues. What did fantasy owners ever do to you, Ravens? We drafted your defense for years. Even after it stopped being a quality unit. We went along with the notion that Joe Flacco was elite. Even if it never applied to fantasy football. We loved Steve Smith and want him to come back, even if he's not the same player. And what do we get in return? A jumbled mess of a running back situation. Now you're saying Terrance West could end up with the starting job. I don't know if we can remain friends. I'm sure that 90 percent of you already knew not to fool around with Randle on your fantasy rosters this year. This is for the 10 percent of you who saw some positive reports on him back in early July and thought he might be a late-round steal. One problem: it's hard to be a fantasy steal when you might not make your team's roster. Welp. For the past couple of years, the Bucs have been trying to make Austin Seferian-Jenkins a thing. But apparently ASJ doesn't want to be a thing as he continues to blow every chance he's getting. Enter Brate, who isn't as physically gifted but is thoroughly outworking his competition. Consider him Jon Lovitz from The Wedding Singer. All summer, the narrative has been that Dorial Green-Beckham is ready to make the leap and be a playmaker for the Titans. That same narrative also said that the Titans coaching staff kept talking up rookie Tajae Sharpe as a way to motivate DGB to get in shape. The narrative didn't have an explanation for why Green-Beckham didn't get in shape before camp started or why he's currently being mentioned in the same breath as Justin Hunter. I'd like to be excluded from this narrative.